Referrals, however, are a tricky business. Some advisors are reluctant to ask for referrals because doing so puts undue pressure on the relationship. Some investors are reluctant to offer referrals because they don’t want to get involved in the financial affairs of others. Spectrem’s new study on the association between investors and advisors determines which investors are more likely to offer referrals to others and which are more reticent to do so. This information can be beneficial to advisors who prefer to work with clients who already are comfortable with the advisor thanks to the referral from a trusted source. Spectrem utilizes the “likelihood to refer your advisor” methodology made popular by Bain, Fred Reichheld and Satmetrix. Investors are asked whether they are willing to refer their advisor and whether they have already done so at some point. In general, the wealthier the investor, the more likely they are to refer their advisor, so let’s look at the Ultra High Net Worth segment from the Spectrem study Advisor Relationships and Changing Advice Requirements. UHNW investors have a net worth between $5 million and $25 million (not including primary residence). Investors are not going to refer their advisor if they are not satisfied with the service they receive, so it is telling that 82 percent of UHNW report overall satisfaction with their advisor. Such satisfaction grows to 88 percent when asked about an advisor’s responsiveness to requests. Despite that base of satisfied investors, only 52 percent of all UHNW investors claim to be likely to recommend their advisor to a friend or colleague. From another question, 65 percent of UHNW investors say they have referred their advisor in the past; is it possible that 13 percent of those referrals went bad in some way, creating the lower percentage of investors who would refer their advisor at some point in the future? This is why it is tricky for advisors to ask for referrals. Investors who are likely to want to share their successful advisor with people they care about are going to do it whether the advisor asks or not. Those investors who are reluctant to get involved in the financial success (or failure) of a friend or colleague are not likely to be swayed by a request from an advisor, even when that advisor has performed more than adequately for the hesitant investor. The Spectrem study segments investors by age and occupation. 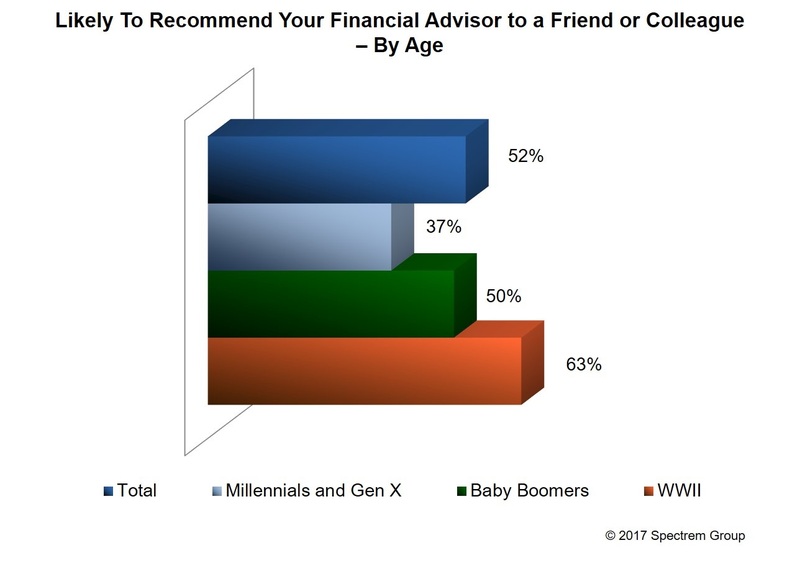 The older the investor, the more likely he or she is to refer their advisor; 63 percent of investors from the World War II era are likely to make a recommendation, while only 37 percent of investors from the Gen X or Millennial generation are willing to do so. Based on occupation, Business Owners are the best clients; 63 percent of them are willing to make referrals. Oddly, Professionals, the lawyers and doctors who also enjoy success due to strong referrals, are the least likely to provide the same compliment to their financial advisor, with only 47 percent saying they would refer their advisor to others. A satisfied investor is likely to invite their children to meet and possibly work with their advisor, so that is one type of referral advisors can hope for. But when it comes to friends and colleagues, advisors may just need to hope their client is the sort who learned sharing in kindergarten rather than ask the investor to pass his or her name along to others who might need a financial advisor.